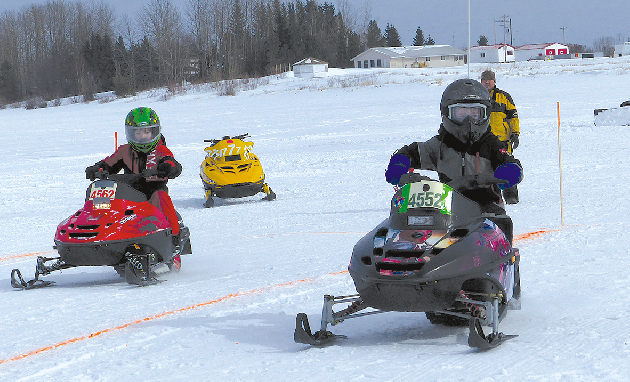 Mother Nature wasn’t exactly the best friend of the Outlaw Sled Drags on Lesser Slave Lake on March 11. On the other hand – it could have been worse! 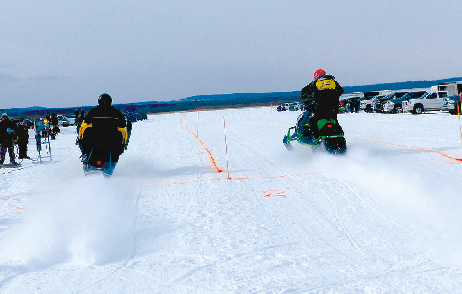 People showed up with their snowmobiles and raced – two and three at a time – down a 600-foot track prepared by the Whitecap Motorsports Park Association of Slave Lake. It was located just off Big Fish Bay campground. Youth 120 cc – Caitlen Thunder; Youth 550cc – Alex Halliday of Slave Lake; 600 – 700cc – Kim Doull of Edmonton; 800 Stock – Ryan Vincent of Slave Lake; 800 Open – Tyler Matt of Grande Prairie; 1000 Stock – Tanner Froehlien of Peace River; Outlaw King of the Hill – Gordon Kozakevich of Lac La Biche. Needless to say, the whole thing was made possible by a lot of hard work by volunteers, with generous support from many, mostly local, sponsors. “Our volunteers stuck it out and did a great job,” says Adam Gongos of the WMSPA. Numbers of participants were down from last year, Gongos says, due at least partly to conflicts with other similar events around the province. The plan is to hold it a bit earlier next year to avoid that conflict.